This week we launched new social media buttons on Collectivator. At the bottom of every item webpage are “Like” “Tweet” and “Pin It” buttons. Now anyone looking at an item on Collectivator (including the sellers) can use these buttons to easily share an item to their social network. I’m very excited about this improvement, but social media does raise some questions. One seller asked me to explain Pinterest in particular, and how the “Pin It” function works. The seller questioned if a pinned image of their stock would remain credited to them. Unlike Twitter and Facebook which display obvious links, Pinterest is all about images. The seller was unsure if an image of one of their items would benefit them or potentially lead to a sale. Basically, would people know where to go if they wanted to buy something they saw on Pinterest? These are excellent questions but I want to start with a basic description of Pinterest for those that haven’t been formally introduced. Pinterest describes itself as an online pinboard for things that you love (you “pin” things of “interest” – see what they did there?). It is a free social media website that focuses entirely on images. Users create “pinboards” that they populate with images they find online. Pinterest makes pinning images easy using their “Pin It” button that you can add to your web browser, or (as we did on Collectivator) to individual web pages. You can also “repin” an image already posted on Pinterest to use on your own boards. When you pin an image it becomes public for your followers, and anyone on the Pinterest homepage, to see. As a way to organize and curate collections of things you want to share, Pinterest works really well. It has a nice clean design and it’s very intuitive, so it’s no wonder it has already captivated 10 million users. Now let’s get back to the question of links and image credit. The general rule of posting an image online is that you should always credit the image and link back to the original source. Pinterest makes it easy by automatically linking back to the webpage where you found the image. This link is a part of the image and remains unchanged even if your image is repinned by someone else. Easy breezy right? Well, not always. What if the webpage where you found the image didn’t own the image in the first place? Hypothetical situation: You googled “McCoy Pottery”, and found an article on Bob’s Blog that had a nice image of some green McCoy pottery. Unbeknown to you, Bob had found that image on my blog and used it without giving me credit. If you pinned the image, the link Pinterest would use would go back to Bob’s Blog, and not to me (the original source). This situation happens more than it should and it can be a major problem for people who make a living from their intellectual property. It’s a reason movements like Link with Love started, and why I recommend if you do use Pinterest to always pin the image from the original source. It makes the internet better and it’s much better karma. It’s a little hard to see because I had to shrink the image, but it shows the basic elements. At the top there is the image with a caption I wrote saying “Flamingos” by 6 Nations artist Chief James Beaver. Captions are required for all images on Pinterest and are usually quite brief. Below the image you see it was pinned onto my board “Great Folk Art”. Below that it reads “Originally pinned by Cassandra Ross” and (most importantly from my business point of view) “Pinned via pinmarket from collectivator.com”. 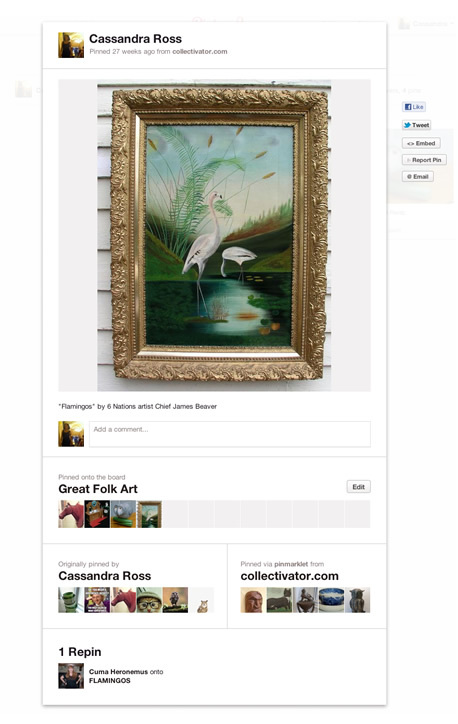 Finally, below there is 1 repin from another user onto her pinboard “FLAMINGOS”. The image is the link so if you click the image you go directly to the item’s webpage on Collectivator. Anyone who repins the image is now essentially promoting the link to their social networks, and as it gets more exposure and repinned it always links back to the original item listing. Pretty good free advertising, right? Also, note that the little thumbnails you see as pinned from collectivator.com were not pinned by me. These were pinned by our visitors. So now we’re getting more awareness for those items in particular, and our website in general. Win win all around. Pinterest is free to use but it is invitation only. Don’t worry – they’re not snobs. Just follow the clearly marked “Ask to Join” link on their homepage and give an email address. Within 24 hours you will receive notice that an account has been created. If you’re a seller on Collectivator posting images of stock, remember to first post the item on Collectivator, then “pin” the image from the item’s Collectivator webpage. When you create your pinboards, give them good descriptive names and be specific. You can easily make more boards as you go along. Don’t be shy! “Follow” other people (either all their images or select boards), as well as “like” and comment positively on any image that strikes your fancy. Even if you’re using Pinterest to post images of stock, remember that Pinterest is a place to get inspiration. Create pinboards dedicated to gardening, cooking, decorating, art, fashion or anything else you want to share. I assume all my readers are proper ladies and gentlemen, but some people on Pinterest leave rude comments or post inappropriate images. It’s rare but it happens. Finally, image is everything. Even your loveliest item will go unnoticed (and unpinned) if the image looks bad. Spend the time and effort to properly photograph your items. If you need some examples, just look around at what other people are pinning. Pin images of items that are visually interesting, and don’t feel obligated to pin everything. A little editorial discretion and effort will pay off when the selection of items you share are admired and repinned by others. If you’re interested you might also want to check out my earlier post on social media for business. Enjoy exploring Pinterest & if you have any questions or tips please share them! This week I’ve been working with a Drupal developer to make some improvements to Collectivator. One of the changes we will soon implement is the addition of “Like” “Tweet” and “Pin It” buttons to every item webpage. For some of you, these buttons are familiar necessities for any online presence. You expect that every bit of information you consume online – no matter how serious or trivial – will be easily sharable with your social network. For others, these buttons are internet fads connected to websites that waste time at best, and promote group think at worst. As a small business owner you have to be aware that social media takes time and effort to maintain. If you decide to promote your business through social media you will be bombarded by new websites, and every time you turn around a social network will be demanding more of your already divided attention. Is social media really worth the effort? In my experience, yes. You must educate yourself but with a few rules and limitations, you can make social media work as a tool for your business. It is not a strategy, and it is not a solution, but it can be a great tool. So let’s start with the basics. Social Media is all online media that connects people together and promotes dialogue and creation of new content. As opposed to old styles of media, for instance television, you do not just receive information. You receive information, respond to it, and create your own. Social Media is everywhere and includes websites such as Facebook, Twitter, Pinterest, YouTube, LinkedIn, WordPress (the very website I use to write this blog! ), and Delicious. Social Media for business works in two ways: it promotes your business for you and it facilitates interaction with your customers. The first part of that equation, promotion of your business, is as easy as putting a button on each webpage you want to promote. Look at the bottom of this blog entry and you’ll see I’ve enabled a selection of social media links. Why wouldn’t I? It’s free and easy to do. If enough people “Like” this article I could even go viral across different social networks and become as popular as an adorably hilarious LOLcat! 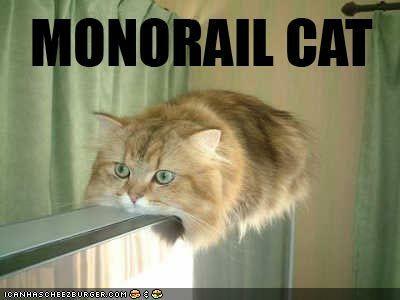 It is my dream to one day be more popular than monorail cat. 1 – Social Media creates personal introductions to your business: Think about all the ads we see everyday across all forms of media. Most ads are ignored but we place higher priority on those messages that come from people we know. It used to be we trusted brand names but we’re moving towards trusting individuals who share our values. If my friend “Likes” a business on Facebook, I might see it on my Facebook wall, and the connection between my friend and that product becomes an implicit clue that I will like the product also. An introduction has been made between me and a business by someone I trust. That’s very valuable advertising, and it is free on most social media websites. 2 – Use Social Media not just to find customers, but to keep them: This is crucial. Most people do not return to a company’s Facebook page after the first introduction. This is because many companies do not fully realize that the point of social media is not to sell, but to create and encourage dialogue. This is “social” media. It’s supposed to fun and interactive. Ask people questions, answer inquiries, and find creative ways to make your visitors create content themselves. People want to communicate on social media, and if your business does not facilitate communication people will quickly look elsewhere. Encouraging this type of communication is a challenge in Collectivator’s social media. It is where I place most of my efforts, and where I need the most improvement. 3 – If a particular type of Social Media doesn’t fit your customers, DON’T USE IT. Your time is valuable and social media is not free because it takes your time. The best question to ask yourself is “will my customers want this?”. Will a plumber’s clients want to read his or her tweets? Probably not. But they will want to see reviews of that plumber’s work on a social media website like Homestars. Google your business and see what forms of social media your competition uses. If you simply cannot understand how a website could help you, no matter how popular it is, don’t use it. Spend your time on those sites where you see the best return for your efforts. 4 – Link your Social Media together for greater strength: When you have decided to embark in this strange new world of social media, remember the cohesive business image you will be presenting to the world. Business website to Facebook page to Twitter account to Pinterest photos to blog (plus or minus any number of other social media sites). Try to keep the branding consistent, create links between the pages (which will in turn help your search engine ranking) and remember that different social media sites have different levels of professional etiquette. These are my tips for dipping your toe into social media for your business, and I am happy to share my successes and failures in future posts. You might be surprised how many people want to engage with you, so feel confident to introduce yourself and get started! I’ve been self employed for a number of years. Although I’m getting better at it, staying organized and productive every working day can be a challenge. New distractions are always coming up, and life outside the office can intervene. To put it simply, without discipline and a clear plan of action I can be a great boss but a crappy employee. 10. Make My Work Space Work Better. The space you work in is very important. I’ve learned that mess on the desk equals mess in my work. Everything from the comfort of my desk chair, ambient light levels, visual clutter and colour of the walls can elevate or depress my mood. It can make me sit down and think “I can do this!” or it can just make me want to start another game of Bejewelled Blitz. This February we’re moving into a new office space, and I resolve to make this space as inviting and organized as I can. Once it’s set up I will dedicate a few minutes after every work session to putting papers away and leaving it clean and inviting for the next use. As Martha Stewart so eloquently said “Don’t agonize, organize!”. 9. Get Regular Exercise. So after I make my workspace clean and organized I’m going to run away from it. I’ve found a small gym nearby and I want to take Yoga and Pilates classes (it hurts my squishy stomach just to type those words) and walk at least 30 minutes a day most days. Sometimes I need to get some fresh air, especially when I’m feeling tense or stressed. If I’m going to sit and not do work, isn’t it better to walk away? As my own boss I can and will allow myself to get moving when I need a break. 8. Limit Email and Facebook Checking. I’ve actually already started doing this and it has made a HUGE difference! Facebook is obviously pretty counter productive from a work standpoint, but I am surprised by how effective it is not to check emails. I can’t imagine how people who have constant messages coming in on their smart phones get any work done! I check my email about 3 times a day and when I’m not actively reading and writing emails the program is closed. It also helps to have a set period of time – say 30 minutes – to answer all the emails at once. I think it has made me more productive both with emails and with other tasks! 7. Blog with Regularity! * I am a fan of fiction writer Harlan Ellison. One thing, among the many things, that Mr. Ellison rants about are all those people who “want to write” but never actually do. The simple fact is that if you want to be a writer you have to write, and if you want to be a better writer you have to practice. I want to write because it helps organize my thoughts, allows me to express myself creatively, and learn through the research on my subject. I therefore resolve to up this whole blogging enterprise to twice a week. *Exclamation point for added optimism! 6. Harness the Power of Social Network Marketing. I’ve noticed that roughly every third person who contacts me is a “Social Marketing Expert”. No matter what your business it can be confusing to know how much to tweet, pin, like, post, zipideedo and zort on the internet. This year I’m going to educate myself and explore how every new social networking website might help my business. I am also going to improve my company Twitter feed and Facebook Page. I’ll share some of my experiences, success and failures on social marketing in this blog – two resolution birds with one stone! 5. Stop Trying to Do Everything. When you have a small business you often have to do everything at first. You are the accounting, customer service, and advertising departments, as well as the CEO. I’m lucky because with Collectivator I’ve always had partners, but I’ve also wanted to keep control of all the day to day operations. With a little realistic assessment of my abilities I see it is imperative that I learn to delegate to others. I need to better rely on the partners I have and seek out experts in areas where I know little or are unwilling to learn. I resolve to improve my strongest skills, while at the same time allow others to help the company in their areas of expertise. 4. Set daily, weekly and monthly goals. For monthly reminders my computer’s calendar program is great. For my changing “to do” lists, however, I know that I am a Luddite who needs to put pen to paper. I have a new weekly paper calendar with a cat motif that is embarrassing to look at but surprisingly effective for my work habits if I keep it up. Among the cat related quotes I basically write my to do lists, appointments, and all the stuff I want to accomplish each day to meet my goals. You might be cool enough to use your iPad, but I enjoy my work mixed with photographs of kittens emerging from various containers. 3. Set a Big Goal and Work Backwards. When you have big dreams sometimes it can be the sheer enormity of the goal that derails your confidence and productivity. I’ve read that good advice is to work backwards and finish small tasks that eventually lead to your larger goal. You don’t have to know every step towards your goal – just the next one on the path. I resolve to take each small step while keeping the big goal firmly in mind. I will tackle my dream goals as small steps with deadlines and in that way stay motivated. 2. Follow my Passions and Be True to Myself. Dear Lord that sounded very “special workshop at the Yoga retreat” didn’t it? Sorry. I mean to say that I started Collectivator, this blog, and my own growing collection of antiques because I have a true and honest interest in them. 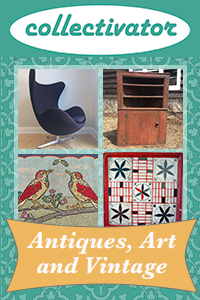 I like that I know about this stuff and I want to learn more and promote antiques in general. I’m going to refocus my energy on that, and keep it positive. There’s a good reason why I’m self-employed and that’s because I like it. 1. Prioritize Prioritize Prioritize. There are so many things I do for work and I like being creative. I like to be inspired by others and that requires lots of clicking around on the internet, reading, and general wayward thinking. I resolve to allow myself this freedom but to also prioritize my work hours for income activities first. Every business has a bottom line and it is imperative that I remember to prioritize my time. If I can make this resolution a hard and fast rule, I know every element of my business will improve, and I will feel great about my work day. So there are my resolutions to improve organization and productivity. I know I’ll have off days and I won’t do everything right. If I have to I’ll just walk away from the desk, make some tea, and try again after a break. There’s always room for improvement and I am always interested in what works for other self employed people, so please share any tips or comments!